This tour presents an ideal opportunity to enjoy a comfortable ride in different types of landscapes. You’ll travel to the north of Iceland and then ride through beautiful valleys and on a water trail on your way across Iceland’s fifth largest lake and over to Borgarvirki, an impressive Viking fortress made out of basalt strata. You’ll ride through untouched nature in Northern Iceland and visit places and hear stories from the Saga ages. Then, after riding, you’ll make a trip back over Kjölur highland route when you’ll be driven between two glaciers, enjoy the hot springs in Hveravellir and visit Geysir and the mighty waterfall Gullfoss. Here’s an outline of the day to day itinerary. Nature may bring about some variance in it, but usually it is followed pretty closely. :Travelers from North America leave for Iceland on an overnight flight with an early morning arrival at Keflavik Airport in Iceland. From Keflavik International Airport, a convenient shuttle bus will drop you at your hotel. Then you’ll have the day to explore Iceland's capital city of Reykjavik and overnight in a comfortable hotel. There’s lots to do and see, and plenty of interesting places to eat. Then get a good night’s sleep, as tomorrow you ride! After you say good bye to the guides and horses, you’ll board the scheduled bus for the Kjölur Highland Route back to Reykjavik. You’ll travel through the rugged wilderness of the Icelandic highland, with the majestic glaciers Hofsjökull and Langjökull, and the green oasis of Hveravellir, where you can soak in the natural hot water pools. There will be stops at the mighty Gullfoss waterfall, before reaching the geothermal field at Geysir . You’ll be back in Reykjavik about 6:30 PM. While the other rideres go to a B&B, we give a bit of pampering by upgrading you to a comfortable hotel room for this last night - your own room, your own bath, all for a good nights’ sleep. For those returning home, the Flybus will take you back to Keflavik Airport. Or you can start further explorations of Iceland - we’ll be happy to help plan those travel. The Trail of Hope runs 7 times in the summer of 2016. Below are travel dates--and it’s easy to add a couple days on either end, if you want to see a bit more Iceland. Your arrival day in Iceland is always a transfer day, which allows you to rest from the short night of sleep on the flight, before you start riding on the second day. For the last night in Iceland we upgrade accommodations to a nice hotel near Reykjavik center..
Finer Print: Price includes round trip airfare, including fuel surcharge and departure taxes from Boston, New York, and Washington Dulles International Airport - ask about prices from Denver, Minneapolis, Seattle, Anchorage, and Toronto. The price also includes all airport transfers, a night before and after the tour in a Reykjavik hotel with private bath, tv, internet connection and breakfast on departure day. During the ride, you’ll spend all nights in double or quad rooms in guesthouses. All meals are included during the ride, while you’ll need to add lunch and dinner on your days before and after the ride. *Not included are travel insurance, meals on pre-and post-tour days and any additional expenses or travel you may choose. 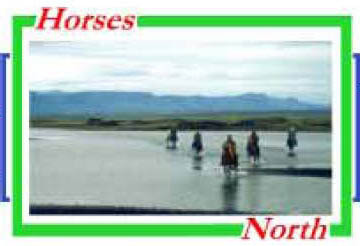 While the riding on this tour is traditionally Icelandic, accommodations during the Trail of Hope are not! You’ll spend comfortable nights in made-up beds in hotels and farm guest houses, in double, triple or quad rooms. An extra bonus will be the chance to travel down Kjölur on your return to Reykjavik, which also incudes a stop at Gulfoss and Geysir. Copyright (c) by Horses North, LLC All Rights Reserved.